Pregnancy is an amazing and special time but also a straining time for muscles and skin. 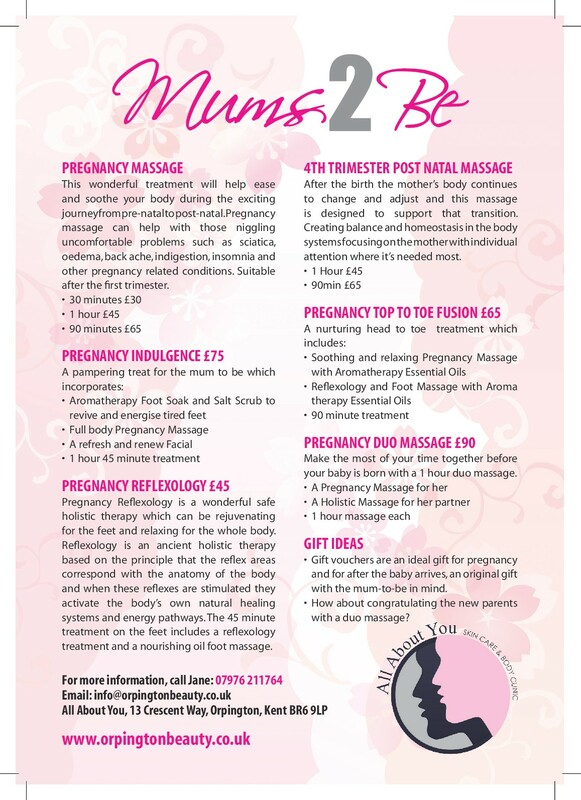 Our pregnancy treatments have always been popular and we want our mums-to.be to feel pampered in every way. We have now introduced our “Bumps A Daisy” products. Expertly developed using all natural ingredients, they have been designed to help battle those common pregnancy nasties from skin tightness, dehydration, and the worst of all…stretch marks! Plus, it provides a layer of comforting warmth and indulgence. Made up of Bumps A Daisy’s Softening Hand & Foot Scrub and Bumps A Daisy’s Anti Stretch Mark Pregnancy Body Oil and a soothing formula, Bumps A Daisy’ Rich Body Moisturiser, the collection is designed for comfort and goodness all round. With ingredients such as wheat germ oil, sweet almond oil, neroli and mandarin there’s no doubt it’s as natural and as soothing as they come.